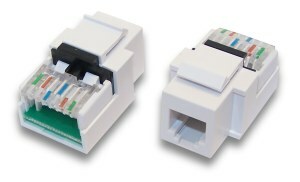 These RJ11/RJ12 Keystone Jacks provide an excellent method of bringing phone, fax, and modem connections into any room. They fit into any standard keystone jack wall plate. Installation is easy and requires no special tools. For those not familiar with "toolless" jacks, the mechanism on the rear of the jack hinges up to allow wires to be inserted, then hinges back down to firmly seat the wires into their connections. A plastic "key" is included to lock the mechanism in place once all wires have been seated. These jacks should be used with 24 AWG solid wire, which most CAT3/CAT5 cables have. Strip back the outer jacket on the telephone cable (around 3/4" to 1" is typical) and separate the wire pairs. Open the plastic clamp on the keystone jack and insert one pair according to the colors shown on the jack. Which pair you do first does not matter, although it generally works best to work from one end to the other. Insert the wires at approximately a 45° angle, trying to insert as close to the plastic clamp hinge as possible. Close the plastic clamp (this forces the wires down into the insulation displacement prongs) to connect that pair of wires. For each remaining pair, reopen the plastic clamp, insert, and close. Do not try to clamp all wires at once. When all wires are clamped in, insert the key lock behind the plastic clamp to secure it closed. For a single, standard telephone line, only the blue pair (red & green) is used.